Last year was set to be extra special for my family. 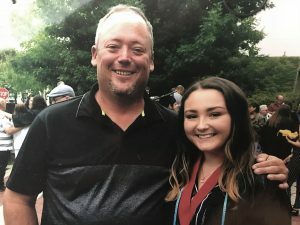 It marked my 20th anniversary teaching at the same district, and after helping more than 1,500 students move toward graduation at my school, it was now MY daughter’s turn to graduate from the neighboring district where we live. Nicolette crossed the stage and received her diploma, and although she and her classmates had my full attention, it wasn’t easy. I had just learned my district had laid me off. They were no longer obligated to honor their commitment to me, although I had honored mine since 1998. My friends and family were shocked and asked about tenure. I explained that the Snyder administration changed some labor laws. I admitted that at the time, they seemed reasonable on the surface. Everyone deserves the “Right to Work,” right? And if a school is laying off teachers, wouldn’t it benefit the students to cut the weakest ones instead of the newest ones? For at least one year, 2016-17, I was that “least effective” teacher. I had no way of knowing, but knowing wouldn’t have helped; my fate had already determined. There was no opportunity for a discussion. Despite having earned a rating of “effective” every year, I was the lowest of three “effective” English teachers, by two one-hundredths of a point—as thin as a hair—or a pay stub. Gradual pay increases came during my first 20 years as I earned experience and a Master’s Degree and continued to develop professionally. I did what I was supposed to do to justify those occasional increases—I stayed in the same district and applied what I learned from my graduate classes to the benefit of my students. In a district making cuts, I was at the wrong place at the wrong time. My wife and I applied for a home equity loan to help weather the storm. Just before approval I stopped getting paid. We no longer had enough income for the bank to justify lending us the equity we carefully established in our own home. Unemployment wasn’t enough to factor into the bank’s decision and is a misconception. It would’ve replaced 10 percent of my salary this year, but any money made scrambling to get ahead while unemployed reduces that amount. Unfortunately, many of us are familiar with the stereotype that the unemployed don’t want to work, but consider unemployment’s structure. I applied for at least forty jobs between May and February and had some interviews. There’s a caution flag attached to a teacher on the job market with so much experience, which I understand 100 percent. Isn’t it the bad teachers who are laid off? Isn’t there chance of recall and we’d have to start a new search? Isn’t it strange someone is willing to start all over for so much less? Could it be the mixed blessing that I haven’t had to polish my interview skills for 20 years? I was only 66 months, less than the length of the average car loan, from having the empowering decision to continue in our profession or retire. A silver lining to this layoff was that I could focus on earning my administrative certificate. Stepping out of the classroom would allow me a different set of opportunities to positively impact others. After I was admitted into the program, I learned the first class relied on researching the school in which I’m currently teaching. Being laid off, I had no school. Having no school, I had to wait. Even self-improvement was delayed. Those in my position cannot begin a new career because the retirement benefits they’ve paid into only unlock by working within the same system whose rules rendered me not only unemployed, but much worse….unemployable. Someone like me is unlikely to work again as a teacher in Michigan. Some would say that I’m just unlucky. Others are right in saying that like so many other Michiganders, I was forced out by the economy. Some people who’ve been stung in “the private sector” have lost empathy. Despite all this, the fact remains that because of recent changes, I was stuck. I’m not sharing this embarrassing story out of retaliation or to be a muckraker. I hope it might add to discussions about Right to Work, the Teacher Tenure Law, school funding, and unemployment benefits. I hope it might add to discussions about evaluation systems that are competitive, isolating, and punitive rather than growth oriented. Are their consequences unintentional? I’m evidence of how easy it is to flush those who’ve effectively positioned themselves. I hope it also inspires state leaders to ensure that the result of their policy decisions are beneficial rather than crippling. I followed the rules of the game, the rules were changed, and despite rounding third base, I couldn’t see home plate because it was moved beyond reach. After an eight-month search, I’m excited and thankful for new opportunities beginning in March with Ypsilanti Community Schools. Principal Gildersleeve toured the building with me and took me to the school’s food pantry; the evidence that we wield the power of good, along with the realization that I had found the right home, almost overwhelmed me. To endure having that power stripped for so long was demoralizing.